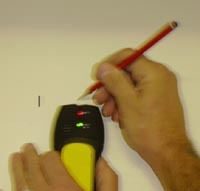 Detecting joists, studs and other timbers, pipes or cables behind plasterboard walls. 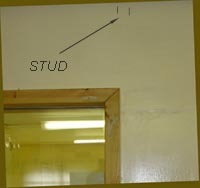 Find out how to use a stud finder to find joists and other items behind walls and make sure that you don't hit them while fixing to plasterboard walls. Finding timber joists, timber studs, pipes and cables behind plasterboard walls is a necessary part of most DIY jobs we do. If you have ever drilled into a wall only to hit a water pipe you will never ever do it again. It is one of the most expensive experiences in any DIY project and totally unnecessary. A stud detector can make fitting shelves, pictures, television brackets, microwave brackets so much easier for the sake of a couple of pounds can save you so much time in filling unwanted investigation holes. Most good detectors operate on a similar principle. They either flash a light, make a sound, or both, when you have found what ever it is you are trying to detect. Combination detectors can find timber, pipes and wires by changing the setting on the detector. To use a detector read the instructions first. Most of them will tell you to practice on a section of wall or other surface where you know there to be timber, pipes or cables. This gives you the hang of setting the machine to the required sensitivity and volume for the job you intend to to. Pass the detector over the area and listen and watch for the indication of your search. For a thin wire or pipe, one signal should be enough but if it is a timber joist, noggin or stud you are looking for you will need to know its width and where it starts and ends. 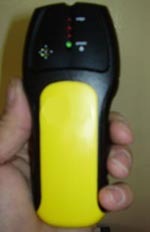 This is usually shown by a variation in pitch or colour on the detector. 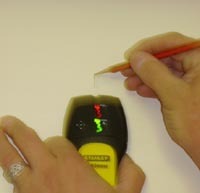 In the example below the detector is passed over the wall until the detector shows both a red and green light. This means it has detected a variation in wall thickness most probably indicating a stud, joist (in the case of a ceiling) or noggin. Moving over the detected area one light goes out to show the thickness detected is not varying however when the end of the stud is found obviously the wall thickness reduces again. This indicates the other edge of the stud or joist and the light display and/or sound reflects this. The position of the hidden timber can be identified and you can now be sure you have something solid to fix to. See the tools section below for multi material detectors.